Look. You Know You Want This Thing. QUALITY MADE - Premium 3 piece grinder crafted with zinc alloy and quality aluminum (When you hold it, the weight of it feels quality, not like a flimsy plastic novelty grinder). Easily grinds and crushes spices, herbs, tobacco, devil's lettuce, dank bud, cheeba, and even that sticky icky. UNIQUE GIFT - Do you want to grind the very best, like no one ever has? 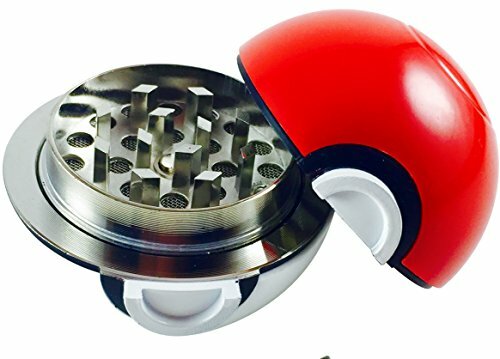 With Pokemon being the new craze, this grinder is a must have. Get one for yourself or give one as a gift. It comes in a giftbox for goodness sake. See the excitement from others when you whip out this thing! MAGNETIC CONNECTION - Striving for quality, we enhanced this grinder so that the top of the Pokeball is magnetized to the bottom. This will ensure you don't lose your pokemon... I mean herbs. LIFETIME WARRANTY - This product is not going to break. Period. Unless you are literally outside throwing it at animals trying to catch them (which we don't recommend). But if for some wild reason you get this thing and you're not 100% stoked or satisfied, let us know. We'll take care of you. If you have any questions about this product by Official, contact us by completing and submitting the form below. If you are looking for a specif part number, please include it with your message.